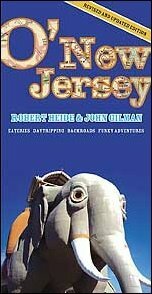 Orginally published in 1992, O'New Jersey: Daytripping, Backroads, Eateries, Funky Adventures was updated and re-released in 2006. It is a mixture of history, pop-culture and facts, all organized into daytrips. This is not a standard travel book and it doesn’t try to be. For each daytrip, there are directions, suggestions on what to see and visit, facts about the area, anecdotes, and highlights of local eateries. There is no attempt to be comprehensive, especially when it comes to places to eat. The authors highlight their favorites, or the ones that the local residents all patronize. In general, their recommendations a very good. Since the book is about daytrips, the authors do not include information on where to stay. Daytrips include Hoboken, Paterson, The Great Swamp, Lambertville, Ocean Grove, The Pine Barrens, and many others. Some descriptions are more informative than others. Even though the book has been updated, there seems to be some gaps. For instance, one trip suggests visiting Thomas Edison’s factory site in West Orange. This National Park has been closed for renovations since 2003. If any particuliar site is important to your trip, I would call ahead. Check out the Amazon listing for a full list of Chapters (each chapter is a daytrip). If you are looking for a comprehensive book on New Jersey Travel, this is not the book for you. It is most useful as a companion book for the history, anecdotes, and accompanying facts that are provided. It is a fun, fast read. I would rate it a 3 on a scale of 1 to 5. It's remarkable to go to see this site and reading the views of all mates about this paragraph, while I am also zealous of getting familiarity. Many House and Garden Tours are run by non-profit organizations. They do not have big budgets to do fancy websites. Often, they only update their websites in the month before the upcoming tour. The links below are the most current available. If you know of a more current one, please let us know.